The 2009 crew of TAP teachers. The spring of 2009 brought TAP to the heart of the Roman Empire, but ancient Rome wasn’t the only thing we studied in preparation for our Italian adventure. Of course gladiators and emperors took a great deal of our focus, but we also studied Renaissance art and literature, science, and, of course, WWII. Miss Massey, Mr. Curtis, Miss Hanley, and Mrs. Harig were all back again, but this time the group was huge – over 70 people, so we added Mrs. Lezza, Miss Lamb, Mrs. Kozbiel, Miss Lara, and Mr. Doerr to our group of TAP teachers. Because our group was so big, we actually had to split our group in half to fly them over to Rome. Miss Massey led the first flight, stopping in Frankfurt, Germany before reaching Rome. Mr. Curtis led group two, with a layover in London before traveling on to Italy. 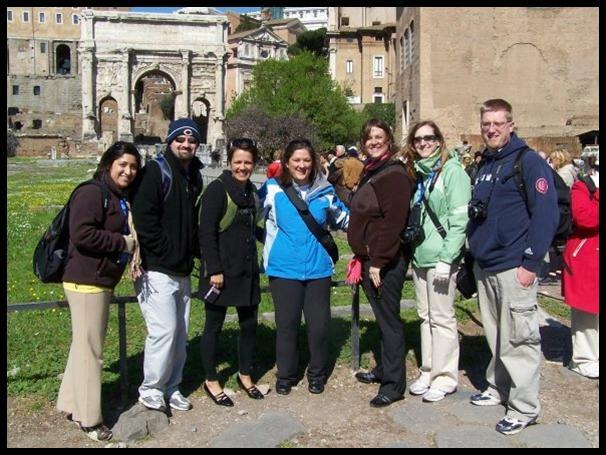 When the group met back up, we met our two tour directors – Anna and Carolina, and began our tour of Rome. There are no small sights to see in Rome, so we started with the biggest of the big, a tour of The Colosseum. It wasn’t long before Minooka kids were acting out gladiator battles and taking pictures from every possible angle. We’d seen some cool things in the first two years of TAP, but this was just about the coolest. We started at the top levels, working our way slowly back down to the ground, and each section was a more impressive glimpse at history than the last. After that, we took a walk over to the Roman Forum – the center of commerce and government in Rome during the Empire. Most of the buildings are in ruins, but there’s enough left of them to combine all of our research and what we saw in front of us to get a good idea of what the Forum looked like in its heyday. After the Forum, we were given some free time to wander Rome. We pow-wowed for a minute, but quickly realized that we all had the same wish lists for what we wanted to see. The Spanish Steps, The Pantheon, and Trevi Fountain were the highlights of our Roman runaround. Then it was time for Vatican City. Holy awesome. Literally, it was both holy and awesome. The museums are set up to weave you through building after building, corridor after corridor of beautiful works of art and ancient relics, all of that leading up to the Sistine Chapel. Standing there, looking up at the ceiling that Michelangelo painted was surreal. 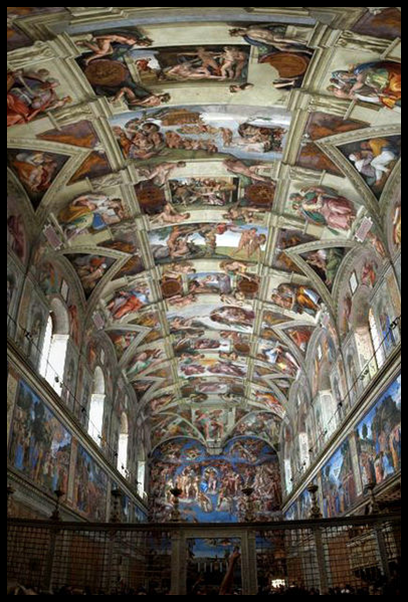 I’ve had many moments like this with TAP, but the Sistine Chapel was one of the times that I just couldn’t believe that I was standing there seeing that. The ceiling is impressive when you look at pictures, but to see it in person just cannot be described. After funneling out of the Sistine Chapel, we made our way to St. Peter’s Basilica, the biggest church in the world. Wow! I’d been in some impressive churches – St. Paul’s and Westminster Abbey in London, Notre Dame in Paris – but this was overwhelming. To think about the history and the stories that went along with that building made my head swim. So we left, stopping to see another Michelangelo masterpiece, The Pieta, on the way out. Of course, all that beauty, religion, culture, and art were followed by a stop in the Vatican gift shop to get pope shot glasses and St. Peter’s snowglobes. We had more Rome in store for us at the end of the trip, but it was time to head to Florence, which is still in my top five cities I’ve ever visited (just so you know – in no particular order – that list contains: Florence, Dublin, Lisbon, San Francisco, and Edinburgh). There was something about Florence that was just so homey and welcoming. We stopped in the Duomo, some of us even making the long hike up to the top; then spent two days wandering around the city seeing Ponte Vechio – near where Carlo Collodi wrote his famous story, Pinocchio; The Church of Santa Croce – where Dante, Galileo, Michelangelo, and Machiavelli are all buried; a demonstration on making goods out of leather, and the amazing statue of David. The sites were great, but my favorite parts of Florence were just walking the pedestrian streets and having a nice slow lunch in the sidewalk cafes. Florence is still one of my all time favorite TAP visits. After Florence, we headed off to Pisa. The Leaning Tower was just one of three amazing buildings. 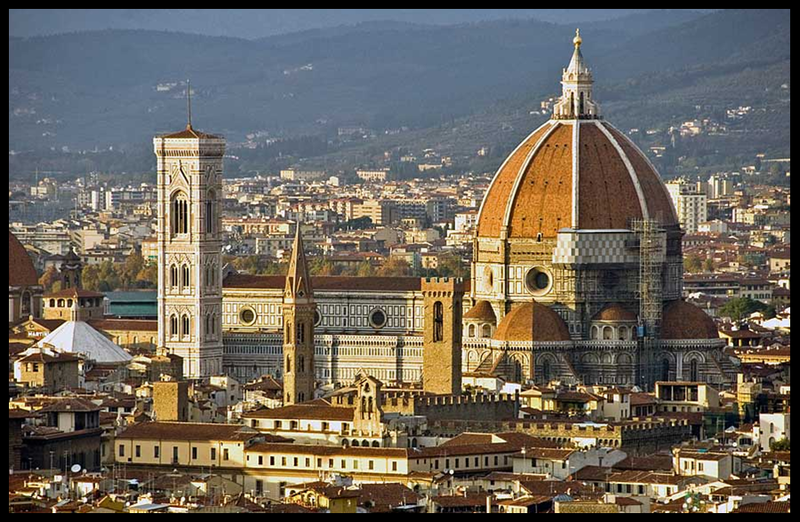 The tower goes with the Basilica of Pisa and the Baptistery. My favorite was actually the baptistery, because our guide gave us an amazing demonstration of how perfect the architecture was. The building is a single room, a huge room, but just one room, and the roof is a huge dome. The guide stood on a small platform in the middle of the main floor and sang at the top of his lungs up towards the ceiling. When he stopped, his voice kept going, and echo of his song literally rolled around inside the dome for several seconds after he was done singing. It was seriously one of the coolest things I’ve ever seen. Our next stop was completely unplanned, but that’s one of the things that happens on our trips sometimes. We were ahead of schedule, so our tour director suggested we spend a little time in the city of Romeo and Juliet – Verona. As a Shakespeare lover, I was all about going to Verona, and it didn’t disappoint. There was a small version of the Colosseum that reminded us of mini-Rome, an awesome pedestrian area of town that reminded us of mini-Florence, and the homes of the “real” Romeo and Juliet. Juliet’s house was really cool. You had to walk through a tunnel like alleyway to get into the courtyard of Juliet’s home, and the tunnel was filled with graffiti. Normally that sounds like a bad thing, but this graffiti was messages and proclamations of love from all over the world – it seemed that everyone who visited Juliet’s place took some time to scrawl some sort of message on the walls. Inside the courtyard was also awesome – a statue of Juliet stood right below the balcony that inspired the the famous scene from Shakespeare’s play. After Verona, we made our way to Venice. Our first stop in Venice was St. Mark’s Square, where we met a glassblower who demonstrated for us how to make things out of glass. That was really cool, so was the lesson we got about Venetian masques later that afternoon. In the middle of the day we toured the Doge’s Palace, St. Mark’s, and the prison – including the famous Bridge of Sighs. Of course we did what every tourist in Venice is required to do – we took a ride through the canals in the famous gondolas, getting a tour from the gondoliers, then spent our free time exploring the city. 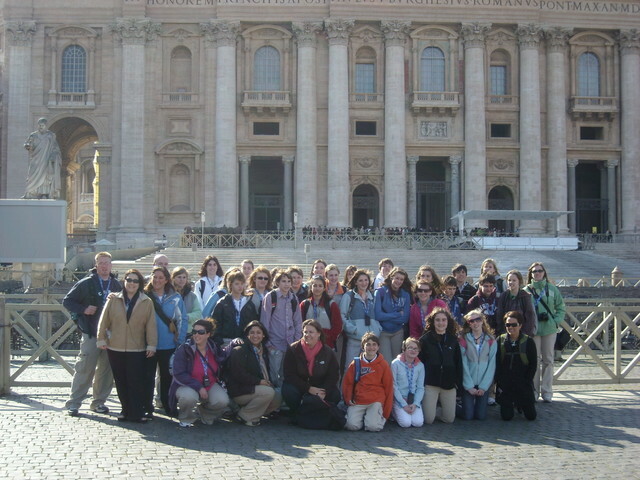 The whole Italy group in the Vatican. Our next stop was Assisi, a walled city up in the rolling hills of the Italian countryside. Assisi was probably one of the most beautiful cities we’ve ever visited. We visited a few amazing cathedrals filled with art and history, but the best part of being in Assisi was being in Assisi – it was a picture perfect look at everything you’ve ever thought about wandering around in a small Italian village out in the country. In a rare moment of downtime for TAP, we sat for about an hour in a square next to the Cathedral of St. Francis and watched the sunset. Assisi also gets a few bonus points for having the coolest hotel we’ve ever stayed in. There’s not a lot of space within the city walls, so they actually made those city walls into homes, stores, and hotels. Our hotel was one of those built into the medieval walls and many of us had windows that were once arrow slots for soldiers to defend the city. The next day we had another unexpected experience. Our guides offered us the opportunity to hike up Mt. Vesuvius to see the view of Naples from above and to get a peek down into the volcano’s cauldron. It was a long, difficult hike, but every member of our group that started made it to the top – the youngest was 13, the oldest 66. The hike was not easy, but the view and the science lesson we got at the top made it worth the effort. That same afternoon, we got to visit the ruins of ancient Pompeii, a city that was buried in ash for thousands of years after Vesuvius erupted. Archaeologists have been working for decades to uncover Pompeii, and it’s remarkable the details you can see in the homes, businesses, streets, and monuments in the city today. As our guide told us the story of the volcanic eruption, the cloud of gas that rolled through the city, and the mountains of ash that buried everyone and everything we could almost picture what it would’ve been like to be in Pompeii that day. It was a hard, but deep and meaningful lesson that reminded a lot of the teachers of our day in Dachau Concentration Camp two years earlier. 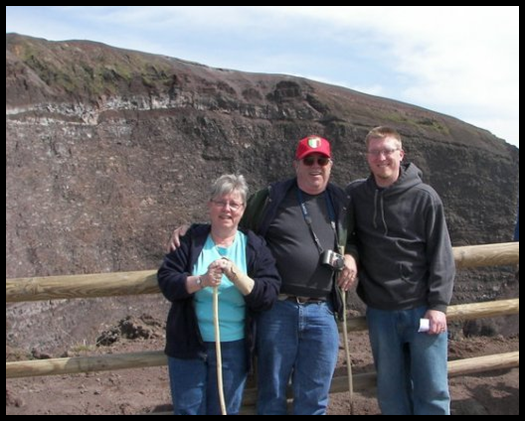 Mr. Curtis and his parents at the top of Mt. Vesuvius. We mixed things up a bit, stepping out of the history zone and visited the island of Capri next. Capri and the boat ride out to it are absolutely beautiful. Storms prevented us from staying out on the water too long, but it was fun to just take leisurely strolls around the island and do some gift shopping. Our trip ended with us back in Rome. We got to walk around the city at night, which was an entirely different experience than we had at the start of our adventure. There was nothing more we could ask from our time in Italy. We saw fantastic works of art by some of the world’s greatest masters, stood in the footsteps of gladiators and emperors in Rome, saw Shakespeare’s muse in Verona, were serenaded in the Grand Canal in Venice, and slept inside the medieval city walls in Assisi. Italy will always have a special place in our hearts, and we can’t wait til TAP can go back and experience it all over again.